Listen to Whyte recite and discuss the poem here (listen with your heart—the audio is not great in some places, but the message is resounding). When the swan transitions from land to water—the element to which it truly belongs—there is a natural ease and flow. When I first read the poem years ago, I longed for that feeling of belonging in my work. I wanted so badly to find my sweet spot. I believed it was possible, but had not yet experienced it for myself. Whyte encourages us all to ask: What is my elemental water? "Where is it that, simply by making contact with that belonging, by being in the presence of that work, I take on grace and timelessness?" A year ago, I let go of the ground I stood on—my full-time job of seven years—and nervously let myself down into the water of my own coaching and consulting business. I'm happy to report: I feel like a swan in water. Last week, I facilitated a planning retreat for a stellar team of independent school advancement professionals. They came together for a super productive day to define the mission of their department, their values, and strategic goals to focus their work in the year ahead. And they spent some really important time reflecting on how they can work together more effectively across different communication styles. They are set up to do amazing things! I felt completely in my element amongst colorful post it notes, fresh sharpie markers, and big brainstorming paper. I had so much fun planning our agenda for the day—learning about their needs and customizing a set of questions and tools to advance their goals—that I hardly slept the night before (I had that Christmas Eve feeling). I felt excited and tapped in but not terrified. I felt completely, naturally myself. These are my elemental waters. It shouldn't come as a surprise to me. Take a look at this photo of high school Carole Ann that I came across. 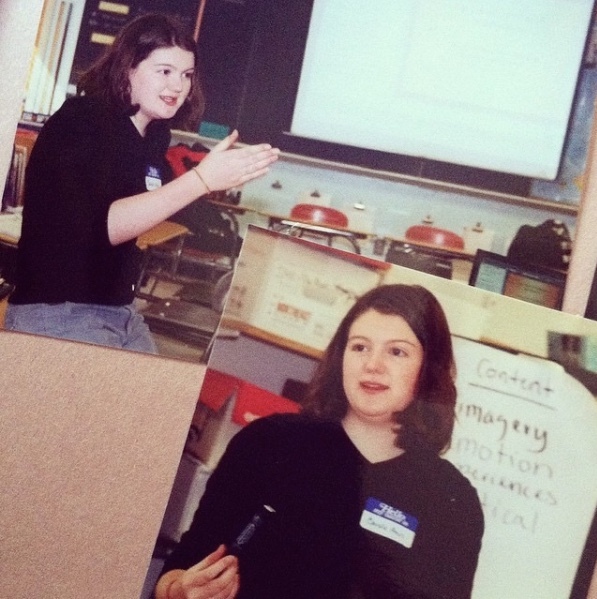 I was invited to another school in a neighboring town to teach a workshop on a topic that I can't recall now—but it strikes me to see my younger self with a marker and big paper in hand, gesturing emphatically. The seed has been inside all along; I'm surprised that it feels more like coming home than reaching a faraway destination. And the hardest part: I knew on a heart level that I belonged here years ago, but it took time to gather up the courage to let go and get in the water. 1. What type of work is it that, simply by being in its presence, gives you a sense of grace and timelessness? 2. Even if you are doing work that you love, Whyte points out that there is a way in which you can do that work that will kill you. Ask yourself: not only what is the work that you love, but what is the way in which you love to do it? How is your way of working different from others'? 3. Who are the people you love to work around? What type of people is it that—simply by being around them—give you that sense of being in your element? 4. How can you take one small step to move towards your "elemental waters" today?